Problem is caused by lldbbridge.py file, where it’s necessary to update few lines. After that, debugger will work like charm. When .plist file is manually updated on MacOS 10.9+, changes are not directly applied to plist cache. This means that these changes aren’t visible to executed application (even if you run it after plist change). "OrmDesigner2" can't be opened because it is from an unidentified developer. You need to create registration here: https://developer.apple.com/. It’s necessary to fill info about contact person and company. After that, your registration will be reviewed by apple team and if everything will be OK, your registration will be approved. Open https://developer.apple.com/account/overview.action ,choose Certificates, Click Add. Than select certificate parameters suitable for your need. In my case it was Mac Development and Developer ID. Note: In my case when I transfer certificate to several developer machines I need to migrate also other Apple certificates. Without that my certificate wasn’t a valid. Now you need to sign your application including all plugins and frameworks inside app bundle. After you sing your app, you can’t do any changes in the bundle. So as first run your deploy as usual and as last step do app singing. Now when you checked that App is correctly signed, it’s time to try it on clean computer where no security policy changes was made. Upload your app and execute it. If you don’t see annoying screen “Can’t execute application from unidentified developer”, you win ;-). If you’re updating existing application, it’s necessary to copy application to different location after Info.plist update. MacOS cache all .plist files and without that update will not be apply. Add these lines to your ~/.bash_profile file. Today I encounter this error after applying macdeployqt to my application. There is a lot of questions about this topic on google but not very answers. The most important thing is setup following variable. Using this you will se which libraries are loaded during execution of your application. The interesting thing is, that I see loading a libraries from their original directories instead of Application.app. But when I temporary moved these libraries from their location, libraries begin to load from then bundle location. The reason for my “QWidget: Must construct a QApplication before a QPaintDevice” was executing an older version of QTitanRibbon from shared libraries path instead of the newest one compiled directly to /usr/lib. The second reason for this issue was caused by another path in “export DYLD_LIBRARY_PATH”. It seems that application search for libraries first in DYLD_LIBRARY_PATH and after in paths from their inner records. In this article I will show how to create DMG installer in reusable way. The most of things and ideas presented here are ideas from several articles mentioned on the end of this article. 1) As first step we need to create our DMG template with link to Applications. 2) Next we have to modify the visual representation of DMG file. 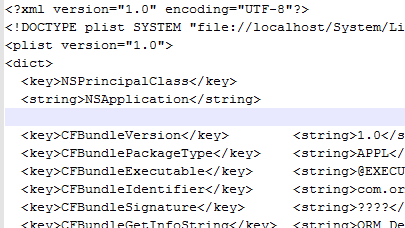 hdiutil attach "$TEMPLATE_DMG" -noautoopen -quiet -mountpoint "$PACK_PATH"
In first part of this article I introduced a manual way how to deploy MacOS application. Because doing all these stuff manually was a lot of hand work, Qt introduced small tool called macdeployqt. That’s all ;-). This command should do all the hard work for you. But in some cases it didn’t. ERROR: no file at "/usr/lib/libboost_iostreams.dylib"
ERROR: no file at "/usr/lib/libboost_filesystem.dylib"
ERROR: no file at "/usr/lib/libboost_system.dylib"
ERROR: no file at "/usr/lib/libboost_thread.dylib"
ERROR: no file at "/usr/lib/libboost_date_time.dylib"
ERROR: no file at "/usr/lib/libboost_regex.dylib"
ERROR: no file at "/usr/lib/libboost_chrono.dylib"
ERROR: no file at "/usr/lib/libyaml-cpp.0.2.dylib"
And this is the problem. Inner path in library is only filename without full path, so when we link library with our executable, our executable also has only relative path. And when macdeployqt try to find this library, automatically try to search in /usr/lib. One possible solution is copy libraries to /usr/lib. Second solution is update paths in libraries to absolute paths. The third way is fix library linker to include full paths in libraries. And if we did everything correctly, now we should have a working app ;-). In some cases you can get error “Permission defined”, “Bad file descriptor” or other similar errors when using macdeployqt. and everything should work ok. Another workaround for this issue is using newer version of Qt. I figured out that on MacOS I wrongly use Qt 4.7.4. When I correct this to version Qt 4.8.2 this issue was solved. This will need more investigation how to make DMG files nicer ;-). As I wrote yesterday, I found the way how to proceed deployment on the Linux system. Today I have to manage it the same on the MacOS systems. Note: the simplest way is introduced in the second part of this article. #path to executable, not .App directory! Now we can see paths to our libraries. The bad news is that MacOS doesn’t have any -RPATH and $ORIGIN. The good news is utility install_name_tool and variable @executable_path which works similar like $ORIGIN. Note: For newer versions of MacOS there are more variables like @executable_path. On version 10.4 was introduced @loader_path and on version 10.5 apple introduce @rpath variable. When we have copied all libraries, we need to change paths for and in all libraries. Here is example how to set libxml2 library. As first step we will check how is library referred. When we checked libxml2.2.dylib library with otool, we can see that library has hardocoded our development path. This isn’t good ;-). So we now change this value to path relative to the executable and again verify this inner path. As you can see, now is path (first line) set up to reffer @loader_path/libxml2.2.dylib. It’s correct now. As second step we have to update path in our executable, because also there is path hardcoded to our library repository. So, now we have changed also path in our executable. And now we need to do all these steps for all libraries….. ;-). To follow the MacOS application convention it’s better to place libraries to folder Application.app/Contents/Frameworks. Here is a directory schema for Qt example application plugAndPaint.